In his preserving cookbook Saving the Season, University of California Master Food Preserver Kevin West writes, “nature’s bounty is abundant, but fleeting,” and encourages preserving as a means of capturing edible nostalgia in a jar. That’s all well and good in California, where a bygone season just means a different bounty at the year-round farmers’ market. But in Maine, the end of the growing season means we’re staring down the decidedly unsexy barrel of local produce like potatoes, carrots, and beets from storage. That is, unless you add one more thing to your already-full summertime agenda: preserving. Entrepreneurial hipsters have driven the cost of a quart of pickles up to the $10 mark, so making your own is not only economical, but immensely satisfying. You can preserve your vegetable pickles in jars by canning them (visit UMaine Extension’s website for recipes, instructions, hands-on classes, and videos at extension.umaine.edu/food-health/food-preservation) or you can skip the food safety concerns and make quick refrigerator pickles. At Salvage BBQ, Jay Villani douses thinly sliced cucumbers and onions in a sweet “bread and butter” brine flavored with mustard seed, turmeric, celery seed, salt, and plenty of sugar. The sweet yet tart pickles balance out the fatty smoked meats and the spicy barbecue sauce. Portland Hunt & Alpine Club’s chef Ricky Penatzer pickles any produce he can get his hands on, sourcing sunchokes, blueberries, beets, green strawberries, and cabbage (just to name a few) from Dandelion Springs Farm, Alewive’s Brook Farm, and FarmFresh Connection. Penatzer serves his pickled concoctions on the various “børds” at the Scandinavian-themed craft cocktail bar, using the pickles’ texture and bright flavors to offset the richness of the cheese plates, deviled eggs, and smoked trout with brown butter mayo. At Piccolo, Damian Sansonetti pickles zucchini, onions, and fennel slices in vinegar, then covers the vegetables with a layer of olive oil. He serves the zucchine sott’olio alongside salumi and says the pickles have a silky, “confit” texture. Sansonetti aims to preserve fruit jams and sauces with his wife, Chef Ilma Lopez, for later use in her intricate desserts. While wild Maine blueberries and apples are available nearly year round, local strawberries, raspberries, blackberries, and peaches are precious commodities. While all of these can be preserved in jars in jams and jellies, freezing whole berries or fruit slices offers a more versatile product. Would-be preservers may balk at the prices per quart at the farmers’ market, so seek out “Pick Your Own” operations. An afternoon spent at Snell’s Family Farm in Buxton or Fairwinds Farm in Topsham can yield pounds of raspberries and blueberries at a fraction of the cost. Between two seasons of light and dark, bounty and scarcity, create a little time to master simple preserving techniques to brighten your plate, whether it’s pickled or sweet. Should you posses the know-how to preserve, but not the equipment, such as canning pots, dehydrators, jar lifters, and funnels, support the fledgling Portland Tool Library. The organizers aim to create a lending library of home and garden tools, including preserving supplies. Donations to their startup fund can be made at indiegogo.com/projects/maine-tool-library-portland--2. 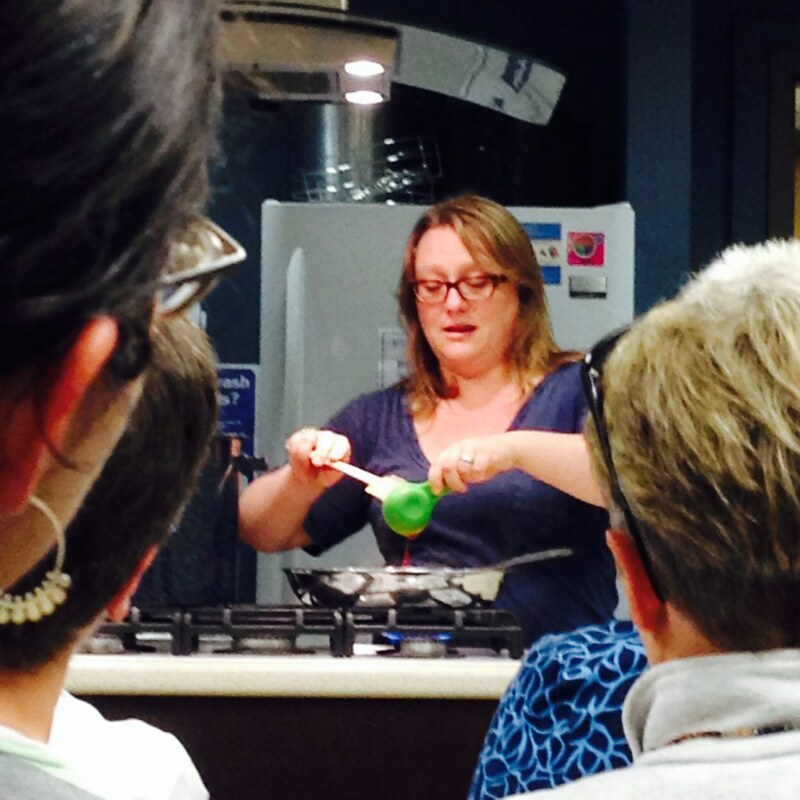 Last Thursday, I had the pleasure of hosting Marisa McClellan, author of two preserving cookbooks and blogger at Food In Jars, at the University of Maine Cooperative Extension in Falmouth. We were all particularly excited to be a stop on Marisa's book tour, since we teach food preservation here and have a big group of volunteers trained to do so as well (Master Food Preservers). I was excited to meet Marisa and then sit in the audience and relax while someone else demonstrated food preservation and fielded questions about jamming and pickling. 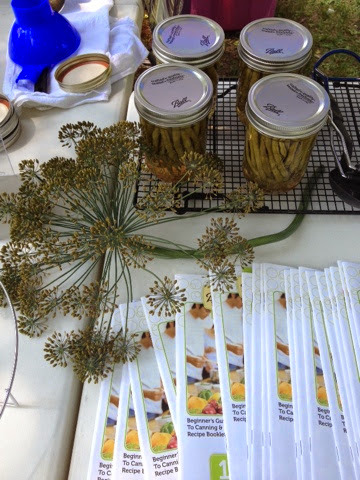 Marisa demonstrated two recipes from her new book, Preserving by the Pint: Quick Seasonal Canning for Small Spaces. These are small-batch recipes, usually yielding one to two pints, and can be completed in an hour or so. Marisa was particularly entertaining as she demonstrated these recipes, quickly putting nervous new canners at ease with her light-hearted approach to the process. After a two-hour demonstration, no one was scared of canning anymore, and we were all inspired by Marisa's delicious recipes. Specifically, Marisa demonstrated making a peach Sriracha jam, which we sampled alongside Cabot's clothbound cheddar cheese. It was a perfect balance of sweet and spicy, with about 1/4 cup of Sriracha added to about 2 lbs. of mashed peaches. Other than the traditional uses for jam, Marisa loves this spread on turkey burgers and roasted sweet potatoes. Wash and quarter peaches. Remove pit. Drop quarters into boiling water for 30-60 seconds, then move to a bowl of ice water. Let cool and remove skins. Place peeled peaches in a large skillet and mash with a potato masher. Add sugar and let stand for a few minutes. Add lemon juice and heat fruit mixture over medium-high heat. Bring fruit to a boil and stir frequently, until fruit is reduced and thick, about 10 to 12 minutes. Look for jam to thicken so that when you pull a spatula through the jam, the mixture doesn't fill in the space you created immediately. Stir in Sriracha and remove from heat. Ladle into hot half-pint jars, leaving 1/4-inch headspace. Process in a boiling water bath for 10 minutes or place in the fridge to enjoy within 2 weeks. As a hostess perk, I was left with a pint of this peach jam, so when I turned to preserving my own peaches, I went no-frills. I canned peach slices in a light syrup, thinking I can make jam, chutney, sauce and pie (or more likely just eat them straight from the jar) later. I ordered a case of peaches from Maple Springs Farm in Harrison (a vendor at the Portland Farmers' Market) a few weeks ago. Farmer Mark of the Peaches drives down to Connecticut, loads up the truck, and sells cases (about 26 lbs.) for $50. I got my own case two years ago, but that was a fairly traumatic experience (see the never-ending peach processing). So this year, I split both the case and the processing with Vrylena. 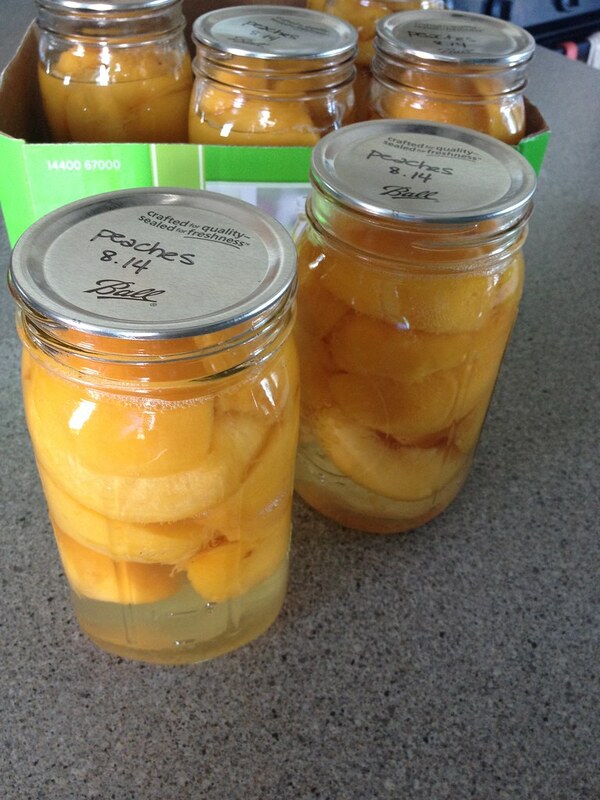 We canned the peaches in one evening, but it still took about 6 hours. We ended up with 9 pints and 10 quarts of peaches, plus a pile of quartered peaches that were too stubborn to peel, that will end up in a raspberry peach pie. Combine water and sugar in a large stock pot, bring to a boil. Stir to dissolve sugar, reduce heat to medium-low and simmer while packing your jars. Wash and quarter peaches. Remove pit. Drop quarters into boiling water for 30-60 seconds, then move to a bowl of ice water. Let cool and remove skins. Slice quarters in half again, if desired. Pack peach slices into hot quarts or pints, cut side down. Ladle hot syrup over peaches, leaving 1/2-inch headspace. Remove bubbles, adjust headspace if needed. Wipe jar rims and apply lids and screw bands. Process in a boiling water bath for 25 minutes for pints, 30 minutes for quarts. Lastly, in self-interested news, the Maine Sunday Telegram is looking for a restaurant reviewer. Their interim critic, Melissa Coleman's stint is up at the end of the summer (I guess that's now? *sniff*), so the hunt is on to fill her spot. With so many great restaurants in Maine, I'd love to see our state's largest paper have a serious food writer/restaurant critic. See the job description below, and forward it onto anyone you think would be a good fit. The Maine Sunday Telegram is looking for a freelance restaurant critic to write our weekly Dine Out Maine reviews. Is that you? Beyond these, you must meet deadlines, write accurately and fairly, and be familiar with the restaurant scene in greater Portland and Maine. We won’t be assigning which restaurant to review each week – we expect you to keep track of openings and new chefs and to propose restaurants yourself. We also expect you to dine anonymously. You will be paid as a freelancer, per review. As a restaurant critic, you cannot attend industry events and meet and befriend chefs -- this job requires that you remain an outsider. Finally, you will need a thick skin. Reviewing restaurants inspires passions, especially in a town like Portland, so you should expect strong responses from readers who disagree with you -- and, when necessary, be willing to defend your opinions. Email writing samples and a resume to Food Editor Peggy Grodinsky at pgrodinsky@pressherald.com. Finalists will be expected to write a sample restaurant review. In researching my recent Portland Phoenix column, Preserve precious produce, I, as usual, gathered information that wouldn't fit into the column. 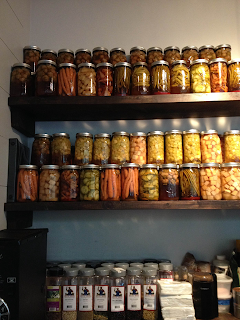 I talked pickling at length with the chef at Portland Hunt & Alpine Club, a place that brings cocktails to mind before pickles. But Ricky Penatzer pickles a lot of produce (and even fish!) to serve on their Scandinavian-themed sandwiches and bords. The nitty-gritty of Penatzer's pickle process was left out of the column, but he has a lot of interesting techniques. Because of health code regulations and time constraints, Penatzer doesn't can his pickles, but instead makes batches of refrigerator pickles. Fridge pickles can last a few months (in the refrigerator, of course), due to the high acid content (i.e. added vinegar) and allow more freedom in your recipe creation. Penatzer creates brines based on the flavor profile of the produce he's pickling. Thinly sliced sunchokes (Jerusalem artichokes) are pickled in a sweet "bread and butter" brine with caramelized onions, celery seed, mustard seed, peppercorns, and lots of turmeric. He blanches the sunchokes in the brine (they shouldn't be eaten raw, as they can cause stomach troubles) as he heats the brine to dissolve the sugar and salt. Conversely, he avoids heating delicate wild Maine blueberries when pickling them, since cooking them toughens their skins. Penatzer boils the brine, but then lets it cool to room temperature before adding the fruit. To add a more complex flavor without the added expense, Penatzer adds a little bit of aged white balsamic vinegar to the blueberries' brine. 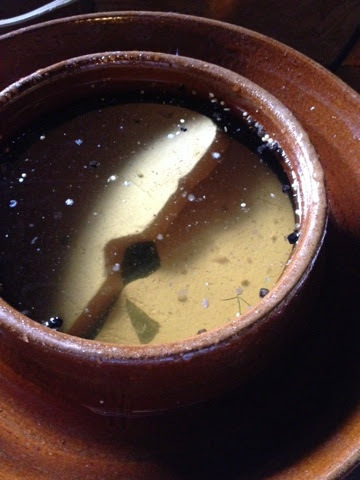 He uses ratio of equal parts white or cider vinegar and water to create the base for the brine, then adds a bit of flavored (i.e. more expensive) vinegars at the end, after heating and cooling the brine. The jar pictured above is pickled fennel, and I should have taken a page from Penatzer's book and blanched the fennel slices in the brine. Pickled raw, the resulting pieces are a bit tough. The brine is equal parts cider vinegar and water, with a tablespoon of salt, and a sprinkling of mustard seeds, peppercorns and red pepper flakes. You can pickle jalapeno slices (they stay nice and crunchy without any added heat), purple cabbage - both great for topping Mexican dishes - red onions, green tomatoes, cauliflower (blanch it), and green beans (again, blanch for fridge pickles). If you love dilly beans (pickled green beans), as much as I do though, you'll have to break out the boiling water bath canner to put up a year's worth of pickles. I made one batch resulting in 7 jars, and certainly need to at least double that volume to make it to next summer. There's a lot of Bloody Marys to be had during football season. Wash and trim ends from beans and cut to 4-inch lengths. In each sterile pint jar, place 1 to 2 dill heads and 1 clove of garlic. Place whole beans upright in jars, leaving 1/2-inch headspace. Trim beans to ensure proper fit. Combine salt, vinegar water, and pepper flakes (if desired). Bring to a boil. Add hot solution to beans, leaving 1/2-inch headspace. Add lids and apply screw bands until fingertip tight. Process for 5 minutes in a boiling water bath. Let cool, check for seals, and label and date. If you're into fermenting to get your pickles, I can't recommend this ceramic crock enough: the Harsch fermenting crock. It's not cheap, but it's doing a great job of keeping my cucumbers fully submerged in the brine. The water lock around the lid is keeping the mold out - my other batch of pickles fermenting in a 5-gallon plastic bucket has blue mold around the edges, whereas the crock has not a hint of mold (the spots you see in the photo below are scum from the fermentation process and floating spices). The 5-gallon pickles have been fermenting for about 3-1/2 weeks and the larger batch in the crock for almost 2 weeks. I sampled the smaller batch of pickles a week and a half ago, and deemed them to not taste like much more than salt. I diluted the brine and left them to ferment a bit more. Hopefully they'll have a tangy, acidic flavor the next time I dip in for a sample. For more information on fermenting, visit the National Center for Home Food Preservation's page on fermenting. Sandor Felix Katz is a great resource for fermentation as well, but more so his book Wild Fermentation and the Art of Fermentation than his website. 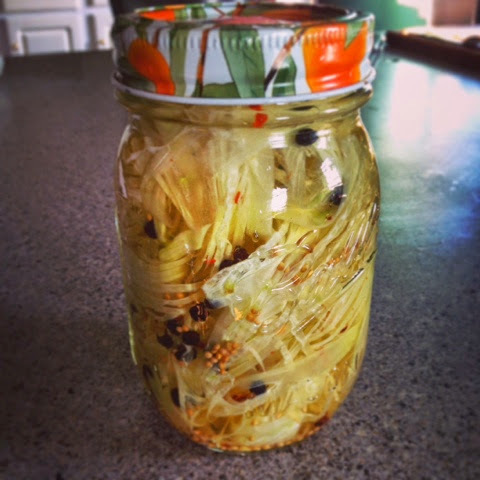 Canadian bloggers at Well Preserved also do a great job explaining fermentation. 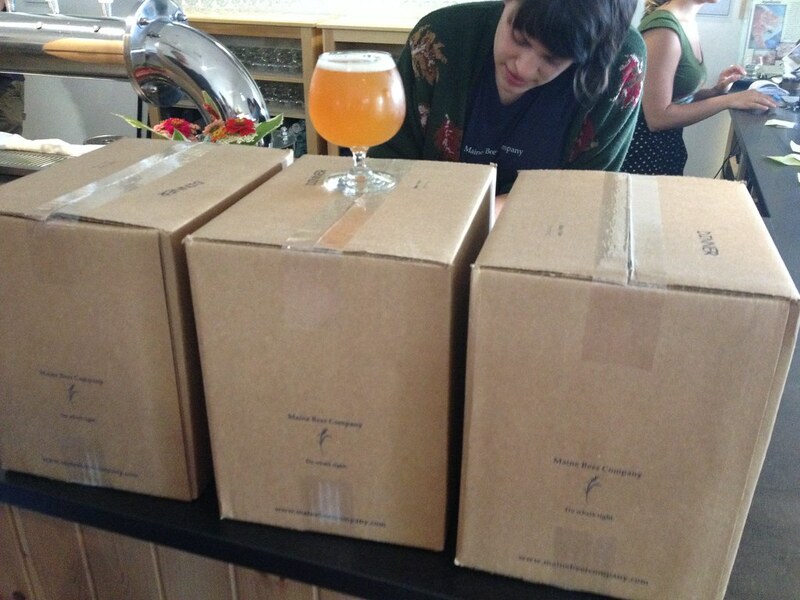 But really, you've just got to get in there and start something fermenting. The produce is in, so start pickling! I'm on vacation! 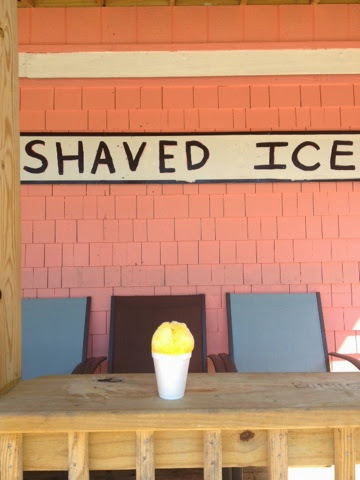 Nothing but peaches, corn, seafood, pools and beaches as far as the eye can see. Until we return to our regularly scheduled programming (ha! 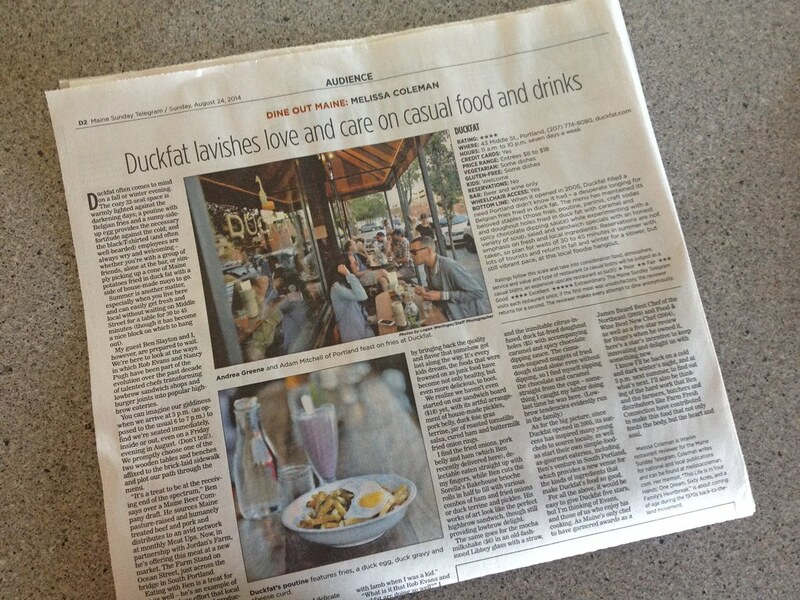 Like I have a schedule...), read my article in this week's Portland Phoenix: Preserve precious produce. 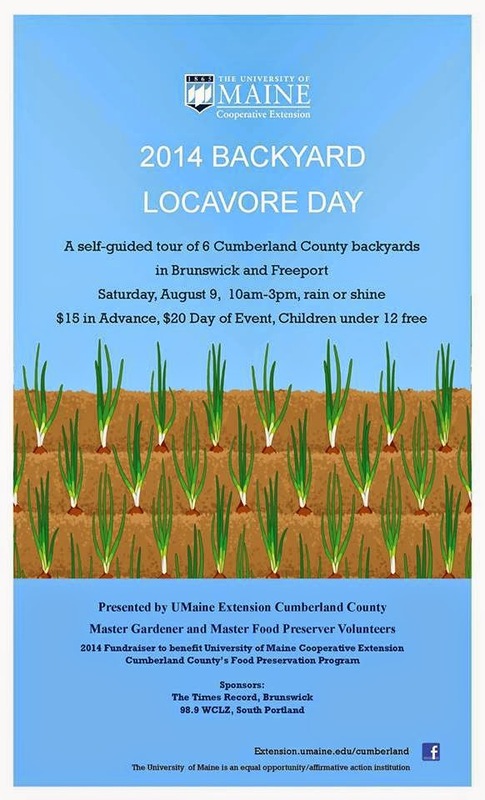 The 6th annual UMaine Extension Backyard Locavore Day is this Saturday, and the weather is predicted to be lovely. All the gardens will have dried out and be poppin' after this week's rain. Come enjoy a stroll around someone else's backyard and be inspired by ways you can grow and preserve your own food. The 6 sites in Brunswick and Freeport showcase a variety of properties and gardens, so no matter where you're at on the food production/preservation continuum, you'll be sure to learn something. Tickets are only $15 in advance, $20 on the day of, and can be purchased online. I will be demonstrating making homemade yogurt in Freeport, so I hope to see you! I will have a few copies of my book, Portland Food: the Culinary Capital of Maine on hand for sale. 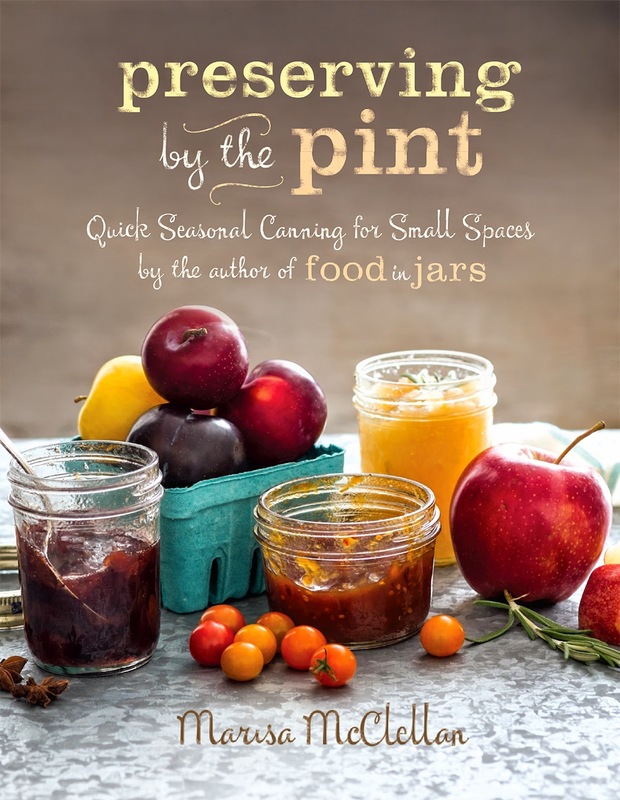 Once the Locavore dust clears, I am so excited to be hosting Marisa McClellan on her book tour for her second preserving cookbook, Preserving by the Pint. 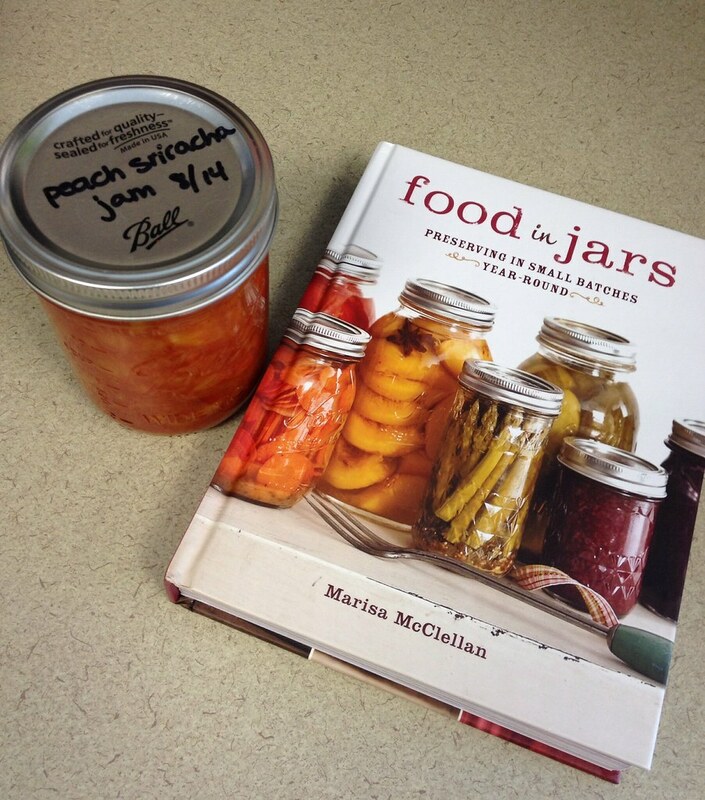 Marisa writes the popular canning blog Food in Jars and published her first preserving cookbook by the same name in 2012. It's a great read, full of inspiring recipes like roasted corn salsa, blueberry-lemon syrup, and even rosemary salt. I'm excited to see her new book, which highlights small batches of preserves. I'm sure it will be inspiring and filled with beautiful photography like her first book. Marisa will be at the UMaine Extension office in Falmouth on Thursday, August 21st from 7-9pm demonstrating three recipes from her second book. I'll be providing pairings for attendees to sample (I'm already brainstorming which local cheeses will go well with), and of course Marisa will sign books and have copies of the recipes she demonstrates on hand. The class is $15 and you can register online (we do expect this workshop to sell out). I never thought myself to be the kind of person who waits in line for beer. I scoffed at the people who, during the last Maine Beer Company Dinner (a double IPA) release, began forming a line in front of the brewery at 7AM. My eyes bugged out when the Bier Cellar guy told me that people waited in line for 45 minutes in the store to buy the previous delivery of Bissell Brothers' Substance cans. I've never been too much of a beer nerd - I drink what's readily available in Portland's beer stores and will at times venture out to Allagash Brewing Company when I hear they have an especially intriguing bottle release. I've never crossed state lines just for a beer or made arrangements to trade beers with someone in another state. I know when I'm out beer nerd-ed, but can usually keep up through the beginning of the conversation. 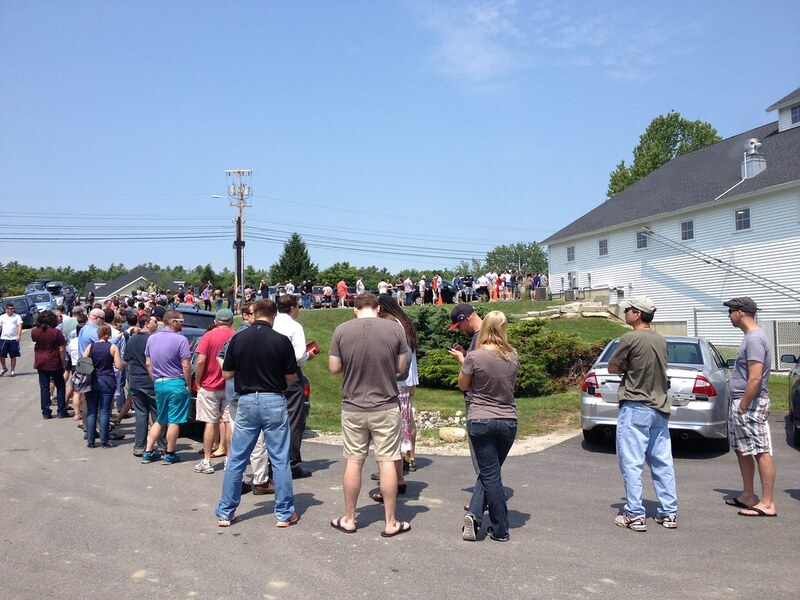 But somehow, I found myself waiting in this line for Maine Beer Co.'s Dinner yesterday. I ended up waiting 2-1/2 hours to buy beer. The last time Dinner was released, I casually drove up to Freeport the day of the release at 3PM. I walked into the tasting room, selected two bottles from the cooler and went to check out (after sampling a small pour, obviously). The counter guy told me there'd been a bit of a line for the 12PM opening of the brewery, over which we both expressed amazement. After tasting the Dinner, I understood why there was a bit of line, but I was happy to have my 2 bottles sans wait. This time around though, with Sierra Nevada's Beer Camp festival happening tonight, there are many more beer fans in town. And the first release of Dinner generated a considerable buzz, with many esteemed beer minds saying it rivals Alchemist's Heady Topper (I tried Heady Topper last week and I like Dinner better, so there). Fortunately, the weather was nice and the crowd was amiable. Of course, after waiting in line for 2 hours next to the same people who are also willing to wait that long for beer, conversation comes easily. I just made the cut off into the brewery; even with a 2 case per person limit, the beer sold out before everyone in line could purchase some. I was thrilled to taste Dinner again - crisp and hoppy with a fruit and slightly bitter finish. A Double IPA done right for me - not too heavy or bitter at the end. And speaking of things that pay off after a long wait, I started a bucket of fermented dill pickles. I was inspired by Laura McCandlish's article in Sunday's Press Herald Source section. 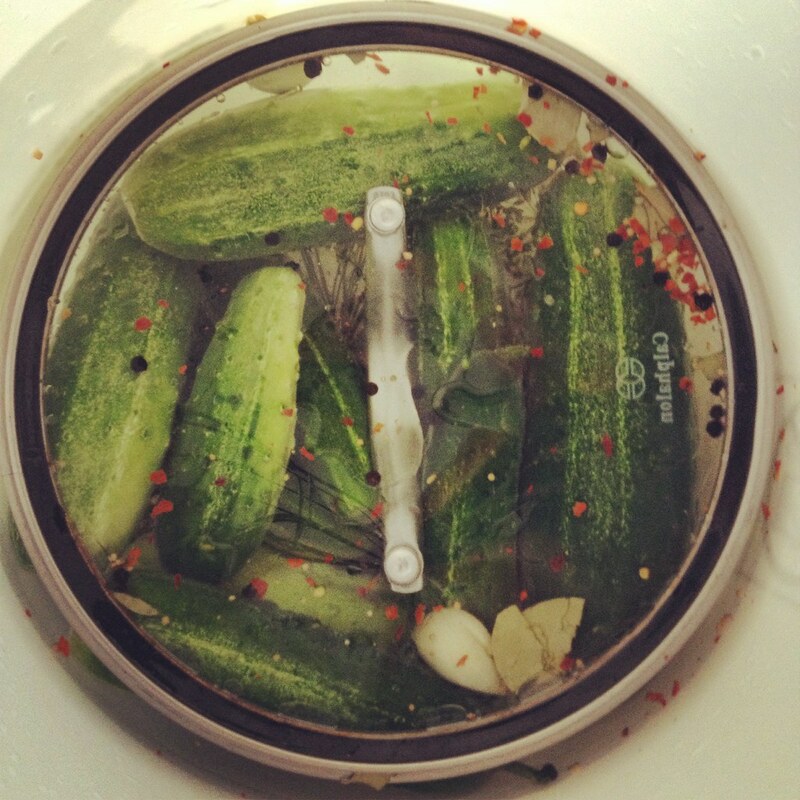 I simply washed my garden cucumbers, mixed up a saltwater brine, layered the spices (dill seed heads, garlic, mustard seed, bay leaves, crushed red pepper flakes) in the bottom of the bucket, and then added the cukes and the brine. I weighed down the floating cukes with the lid from a pot - especially nice, because it's clear and I can keep an eye on the progress of the cukes without disturbing them. Use a food-grade plastic container (ask a deli if they have a pickle bucket you can have). You don't have to buy a fancy pickle crock, but you certainly can. The Cadillac of crocks, the Harsch Fermenting Crock, is (was, at least) available through Cabela's. They also sell ceramic crocks locally at the Urban Farm Fermentory. Remove a tiny slice (1/16-inch) off the blossom end of the cucumbers (the non-stem end). The blossom end traps enzymes that will cause your pickles to soften over time. Add a small amount of vinegar to the brine to lower the acidity (1/4 cup for 8 cups of saltwater brine). After a few days, the naturally present lactobacilli will begin to do their thing and create an acidic environment. But the vinegar helps to prevent spoilage organisms from growing before the bacteria produce lactic acid. Store cucumbers for fermenting in a cool space. Between 70-75*F is ideal; any warmer than that and the pickles will ferment quickly, producing off colors and texture (i.e. soft pickles!). I tried a batch when it was very warm out, and I lived on the 3rd floor. They turned out inedible. Now my bucket is in the basement, where it's cool and dark. For more information about fermenting vegetables and dairy (e.g. making yogurt), see the National Center for Home Food Preservation's page on fermentation.